Most of my pictures on this blog so far have described the old parts of Stockholm. Now it is time to share a few pictures of the new parts. Here is a picture of Hammarby Sjöstad. Hammarby Sjöstad (roughly translated: Hammarby Sea City or Hammarby Lake City) is a part of Stockholm, the capital of Sweden, currently undergoing major urban redevelopment, It is located southeast of Södermalm. 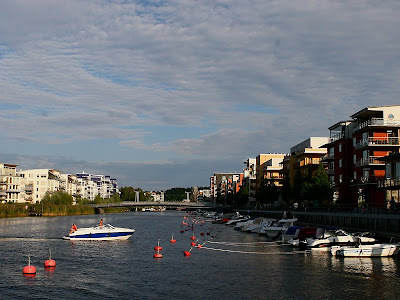 Before the current redevelopment began, the waterside area was known as Södra Hammarbyhamnen (roughly South Hammarby Port), a mainly industrial zone. The neighbouring Lugnet was a run-down light industrial area, housing an impromptu trailer park. This has rapidly become an attractive area. Some of us still remember all the controversy about poor construction practices which caused a lot of bad press (not to mention some mildew!) in the early days. Lovely picture, and thanks for the story too. It seems that these old dock areas are increasingly attractive in all cities!